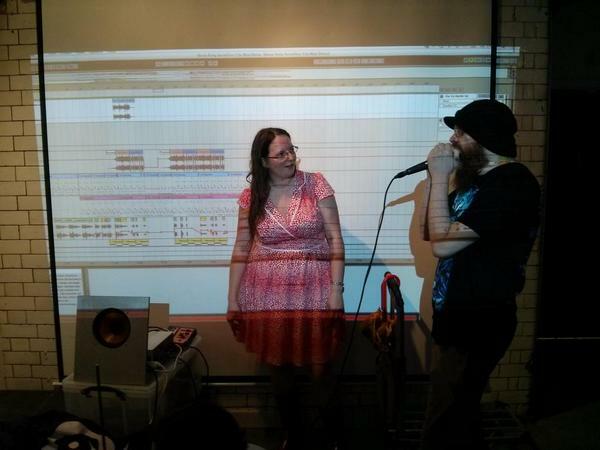 For our July event, we organised an audiovisual extravaganza called the Girl Geeks’ NOISE PARTY (capitals obligatory)! We held it at TwentyTwentyTwo in the Northern Quarter, which had a fantastic room we took over for the duration. First up was Dan Hett, a senior game developer for BBC Children’s, who livecodes visuals in his free time. He did a fantastic talk about using Cyril, an environment he’s developed, to make some awesome glitchy visuals. Videos courtesy of Zoe Breen. During the coffee break we had a chance to play with some awesome things. Firstly, Ruth Perkins from Science Made Simple brought along a Theremin and a voice changer, which was a lot of fun! We also had Tobin from Manchester Science’s Festival’s Hooked On Music project, with tablets for us to play their music game, which explores what makes music memorable and catchy. The results will be used to explore the science and therapeutic effects of catchy music. The game is at the link above if you want to have a go! After the break there was a fascinating talk by Nick Donovan, otherwise known as DEAD BEAR. Nick showed us how he uses found sounds and samples, layered on top of each other to make unique tracks. The performance included ambient sounds, white noise and glitchy screaming, all to the backdrop of Dan Hett’s live coding. This part was totally unrehearsed and amazing. All in all it was a fantastic afternoon. Thanks to everyone who braved the downpour to come out and join us for this event!